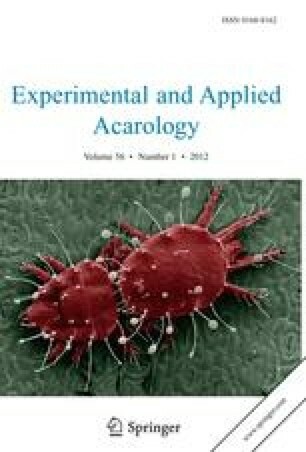 Several aspects of parasitism of the pea aphid,Acyrthosiphon pisum (Harris), by the mite parasiteAllothrombium pulvinum Ewing, were examined in the laboratory. Larvae ofA. pulvinum were fastmoving mites that find their host by contact of their foretarsi with the host. They can attach to all parts of the host body, but insert their chelicerae only into weakly sclerotized parts such as intersegmental membranes. Of the attached larval mites, most (63.5–74.1%) were on the thorax of their hosts, regardless of host size. In hosts of small and medium size, the ventral side receives most parasitism, whereas in large hosts the lateral sites are most often attacked. Larval mites prefer large hosts when allowed to select between pairs of large and small hosts, but show no significant preference when allowed to choose between pairs of large and medium hosts or pairs of medium and small hosts. In two-choice tests, larval mites prefer previously parasitized hosts to umparasitized hosts, which results in superparasitism of the hosts. When the mite load is fiveA. pulvinum kills all small hosts within three days, and all medium hosts and 50% of large hosts within four days, the reproduction of surviving adult aphids were significantly reduced. Host-finding behavior, attachment site preference, host size selection, superparasitism, and effect on hosts are briefly reviewed for larval parasites of Trombidiidae. The potential role of larvalAllothrombium in integrated and biological aphid control is also discussed.